Traditional Product Training is Boring. If you are thinking about running a traditional product training event at your next kick-off, - think again. Traditional product training doesn't work any more; buyers hate PowerPoint product presentations and so do salespeople. We need to explore new and more empowering approaches to helping salespeople achieve success in positioning and selling technology products and the rapid uptake of new ideas and skills. Getting the sales team to DO training using Visual Confections and Storytelling works and salespeople can tell their story the very next day with newly found communication technique. We help clients create the Visual Storytelling deliverable in the form of the visual confection and script as the output of the Messaging Alignment and visual story development process. 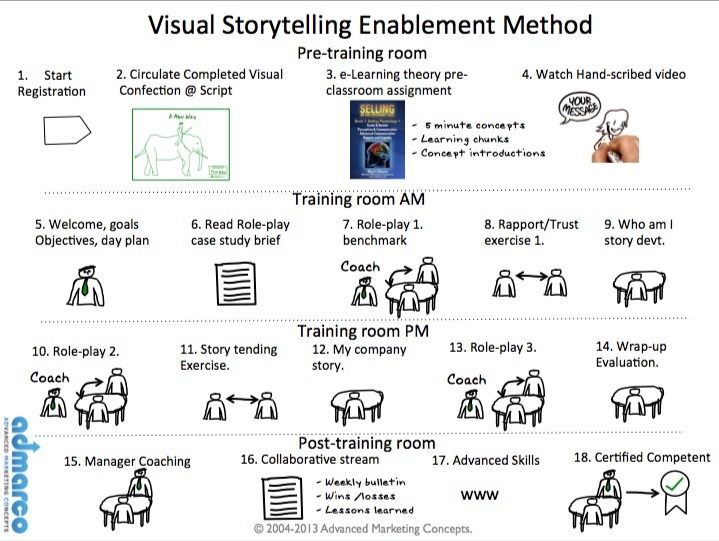 We use the Visual Confection as the training document in the Visual Storytelling Enablement Workshop. A ONE-day skills workshop that combines visual storytelling, role-playing using visual confections, interpersonal communication skills, during which every person will be immersed in practical role-plays, story and skill development.